Prolific author James Robert Parish answers a few questions about his latest tome, The Hollywood Book of Breakups. Unlike his previous book, Fiasco: A History of Hollywood's Iconic Flops, an analysis of Hollywood moviemaking, the Book of Breakups focuses on the private lives of those who have worked in the motion picture and television industries. Couples portrayed in the book range from silent-screen idols Mary Pickford and Douglas Fairbanks to super-market tabloid idols Jennifer Aniston and Brad Pitt. In your latest book, The Hollywood Book of Breakups, you discuss the personal relationships of film and TV celebrities. What is your approach to writing a book on something potentially sensational, without falling into the trap of tabloid journalism? What were your criteria for the couples found in the book? My aim was to present a representation of couples from various eras of Tinseltown history and to include in that mix some duos that married, others than just lived together, and, in the case of Lana Turner and her gangster boyfriend Johnny Stompanato, a romantic pairing that ended with one (Stompanato) of the twosome killed. Many of the couples discussed in the Book of Breakups are still alive. How careful must you be when discussing their private lives so as to avoid litigation? My process is to verify with several sources the data discussed in the write-ups for each couple in the book, especially when the text deals with sensitive issues. In terms of media coverage, which Hollywood breakup would you say was the most discussed? And why? I believe that the Lana Turner-Johnny Stompanato 1958 split (which was the ultimate breakup since his life ended so abruptly) and the subsequent high-profile coroner's inquest in which Lana testified on the stand was certainly one of the top media circuses in Hollywood history. Also the 1992 ending of the Woody Allen-Mia Farrow years of togetherness (both on and off the screen) with accusations and charges being hurled by both parties created a tremendous media frenzy which was headline material for months and months. Apart from Ingrid Bergman's in the late 1940s, has any other Hollywood career been ruined by a scandalous divorce? At the time Mary Pickford and Douglas Fairbanks, Sr., divorced their respective spouses and then wed one another in 1920, these two silent cinema superstars had great apprehension that their actions would cause substantial disaffection among their fans. To the new couple's great relief, that didn't happen. Decades later, when Woody Allen and Mia Farrow (who had never married) split and it was revealed Allen had been dating Farrow's adopted daughter, Soon-Yi, there was a noticeable drop in the box office take for Woody's subsequent pictures. However, by the time of Match Point (2005), moviegoers seem to have forgiven – or at least chosen to overlook – Allen's once highly controversial private life. Would you say that people today are more obsessed with the private lives of celebrities – or has it always been that way? I believe the public has always been intrigued – to one degree or another – with the offscreen activities of notables. Today, with the rash of TV/print tabloid outlets, Internet sites, blogs, and email newsletters covering the offcamera goings-on of celebrities, such coverage is both more pervasive and instantaneous. And finally, were there any couples you wish had been included in your book – but for whatever reason were left out? In making my selection of couples for The Hollywood Book of Breakups there were many – if space had permitted – that I would have liked to include (e.g. Roseanne vs. Tom Arnold, Priscilla Presley vs. Elvis Presley, Mae Murray vs. Prince David Mdivani). And of course, stars being stars, there will always be new breakups and divorces that have an intriguing twist. As such, there are lots of candidates for a sequel to this book. 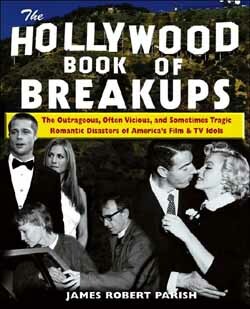 One would need several volumes of an encyclopedia to include every single major Hollywood break-up.